So lately, I've gone all mother earth on my family. It all started with me griping about the ingredients in store bought ice cream on social media. Then my Facebook friends recommended I watch the movie Food Inc, an expose on how industrialised and contaminated the production of our food has become, which disgusted me. Subsequently, I started making healthy chocolate ice cream and now some home made bread. 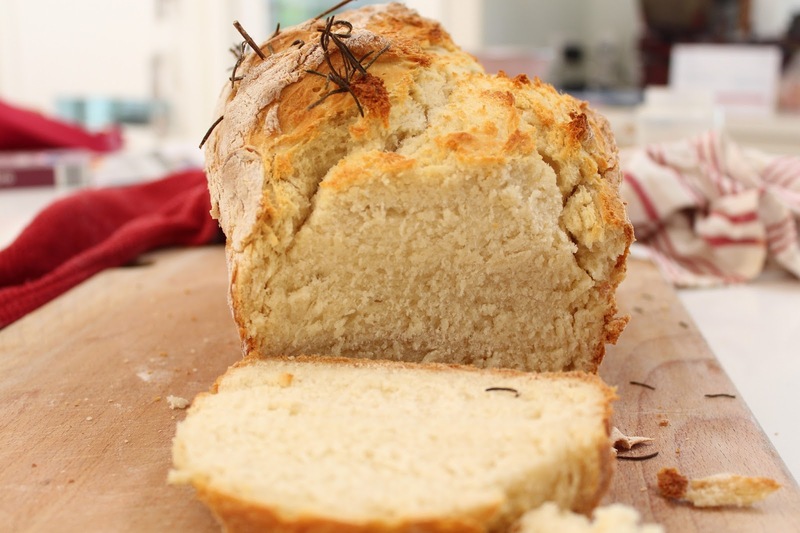 This bread is not new to me and is a recipe I have used many times. I was first introduced to it at play group. Instead of play dough, we used to have bread making and it was fantastic. Each week the children made their own bread roll and when they were cooked, we all used to ooh and ah over this fantastically yummy hot buttered bread. Of course there were calls to share the recipe, which the lovely Jana graciously did. I made this one with white flour and I accidentally used self rasing flour. It turned out quite OK, but was a little more doughy than if I'd used plain flour as the recipe calls for. I'm also proud to say the cherry tomatoes and basil in this delicious meal are also out of my vegetable patch. That is a good feeling, but I did say to Mr Beach House, thank God we were not relying on the vegie patch alone to supply our full compliment of vegetables. I think if the famine comes, we will not be OK.
Make a well in the centre of the flour and poor in the water. Add seeds if required and mix with a wooden spoon. Sprinkle flour over a clean surface, such as your bench top. You will need flour on your hands as well to avoid sticking. Knead the dough together for 3-4 minute until it comes together in a ball and is no longer sticky. If it is still sticky, add some more flour and repeat. Leave to rest in a warm place in the bowl covered with a damp tea towel for 30- 40 minutes. This allows the bread to rise. Place dough into a loaf tin sprayed with oil. 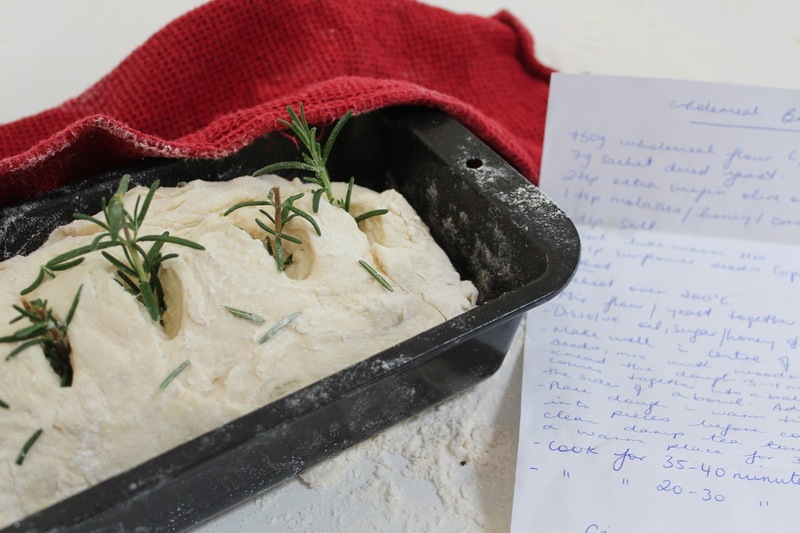 Cut slots in the top of the dough with scissors and stick rosemary sprigs into the slots if desired. Cook for 35-45 minutes if leaving whole. Or divide dough into small handfuls and roll into balls. Place rolls onto a try lined with baking paper and cook for 20-30 minutes if making bread rolls. Instead of sunflower seeds, you could use walnuts, pumpkin seeds, pine nuts, sultanas or poppy seeds. 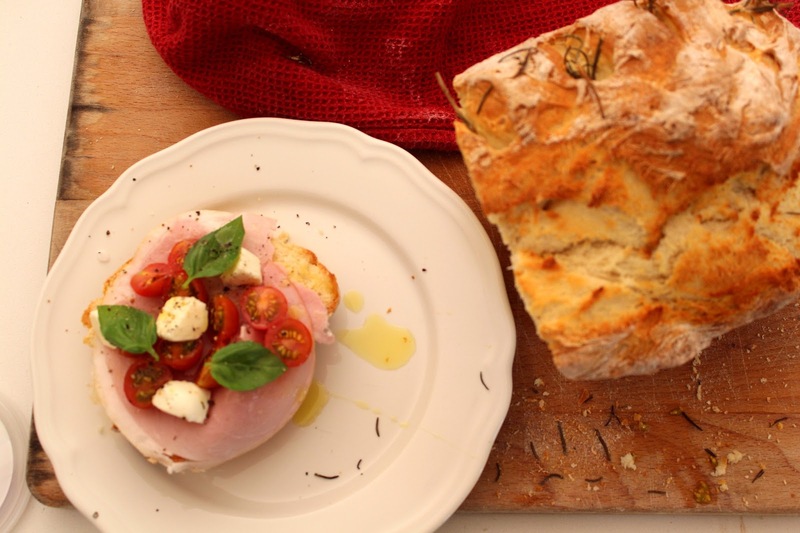 To serve add ham, cherry tomatoes, bocconcini cheese, basil and drizzle with lemon infused olive oil, salt and pepper to taste. Or just with some lovely butter and Vegemite if you are an Aussie. And feel healthier by the minute. 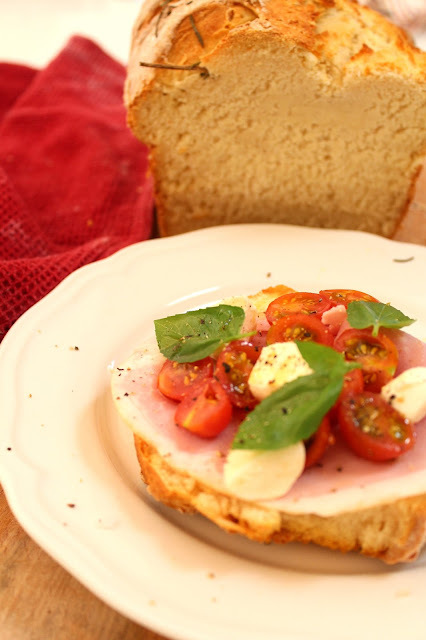 The bread is best eaten on the day of baking, but makes gorgeous toast there after. For all my other recipes, go here for sweet and here for my weekend night wonders. Nothing beats eating fresh homemade bread! 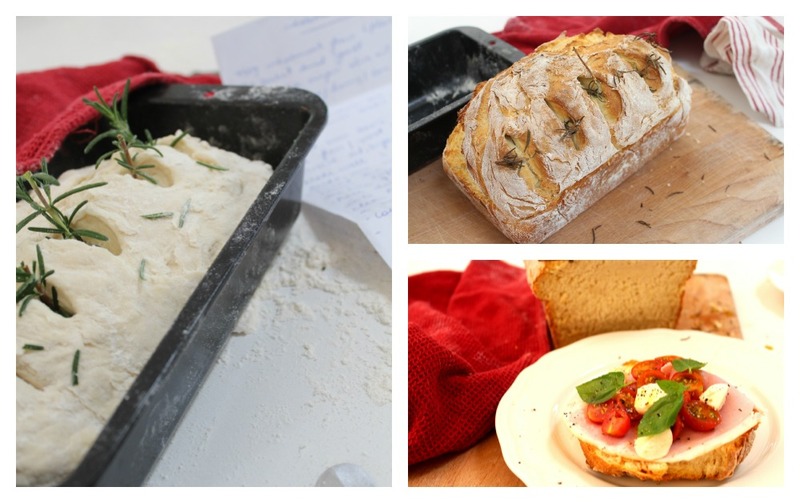 I go right into bread making just before I went GF - I still miss that lovely fresh bread! 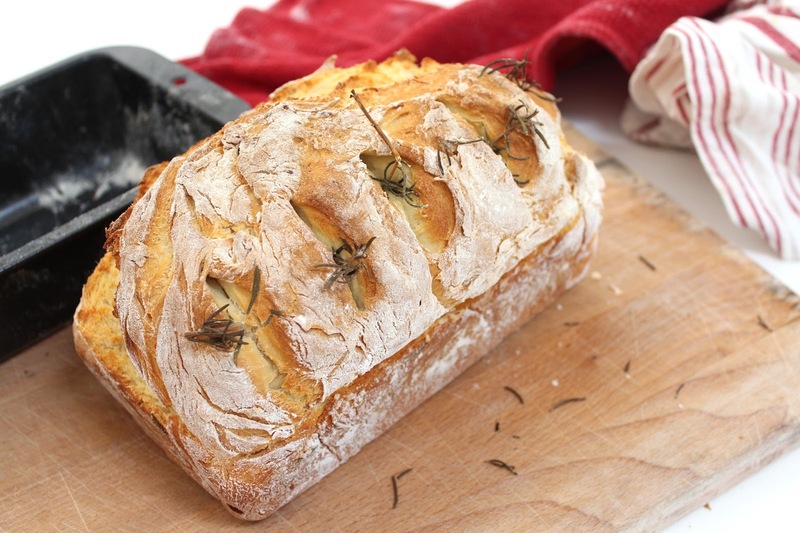 This bread looks amazing - far better than anything you could buy in a store! And that movie Food Inc shook me too, such a terrifying insight into the industry. I'm meant to be avoiding carbs, but that looks bloody good! I enjoyed this post. Gave me a chuckle. (So many of your posts do, as you write with much wit!) I admire that you are doing so much to keep you and your family healthy. I'm not much of a cook but feeling that I must become one soonest. Unhealthy "fast" food and processed food here in the U.S. is making a lot of us sick with multiple diseases; in a fast-paced life, we rely on it too much. It catches up with you over too many years...obesity breeds so many problems, not just with cholesterol and the heart, but also the cancers. It's important to put good fuel in the body, but then also to MOVE the body and keep active. They're not lying about this stuff; the body WILL give out if it's not properly maintained. I speak unfortunately from experience. Anyway, I think your bread looks like a delicious treat. Vicki. Thank you for your kind words about my blog. I appreciate you popping in to say all those things. Wow! Great post! I always wanted to learn on baking, either cakes or breads. It's amazing to know that bread is actually very simple to make, and homemade one is even tasted better than bakery. Thank so much for letting me know Dee. I really appreciate the feedback.